THEATRE OF THE ABSURD, yesterday’s topic here at SimanaitisSays, is an excellent metaphor for the current political scene. There’s unreality, cliché, tragicomedy, and a person here and there striving to make sense of it all. One of the genre’s playwrights, Václav Havel, not only wrote about politics, he also served as the last president—and subsequently the first president—of his homeland. Another, Eugène Ionesco, witnessed fascist acquiescence first-hand in his native land and then later composed a play about it in his chosen country. Party Politics, Theatrical and Otherwise. Václav Havel’s intellectual upbringing led him, initially as a stagehand, into the lively Czech theater culture of the early 1960s. At the time, Czechoslovakia had been under communist control since 1948. 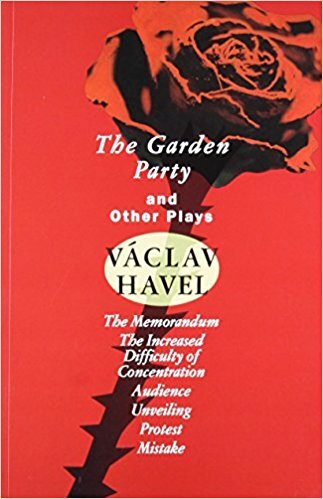 The Garden Party and Other Plays, by Václav Havel, Grove Press, 1994. The Garden Party, 1963, was Havel’s first play to be performed in public, an Absurdist statement protesting communist bureaucracy. Its main character Hugo Pludek is encouraged to curry favor with Mr. Kalabis, who is supposedly attending a garden party held by the state Liquidation Office. Hugo never does meet Mr. K, but he encounters other functionaries who speak in Absurdist content-free language about their nonsensical existences. Alas, Hugo adapts. He learns to speak platitudes with such impressive, albeit meaningless, clichés that he’s named head of the newly created Central Inauguration and Liquidation Committee. When he returns home, his family doesn’t even recognize him. 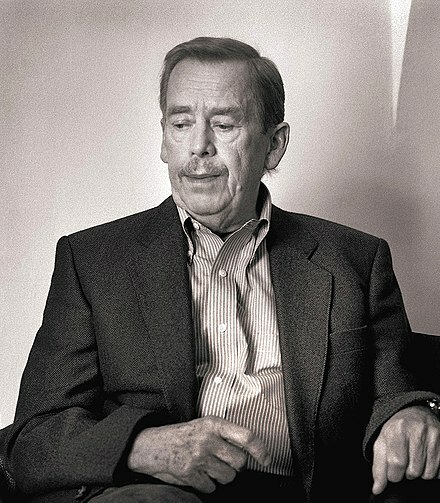 Václav Havel, 1936-2011, Czech playwright and statesman. Havel was active in the Prague Spring, when in 1968 the Soviet Union and its Warsaw Pact lackeys invaded Czechoslovakia. His theater activities were subsequently banned, which prompted Havel to show political protest in other ways. Multiple incarcerations followed. In one of nearly four years’ duration, he wrote letters to his wife which were later published as the book Letters to Olga, 1989. In 1989, Havel and his Civic Forum were instrumental in the Czech Velvet Revolution that freed them from the crumbling Soviet empire. Subsequently, he was elected the 10th President of Czechoslovakia. He was also destined to be its last: In 1992, the country was divided peacefully into the Czech Republic and Slovakia. Havel served as the first President of the Czech Republic from 1993 to 2003. He died, age 75, in 2011. 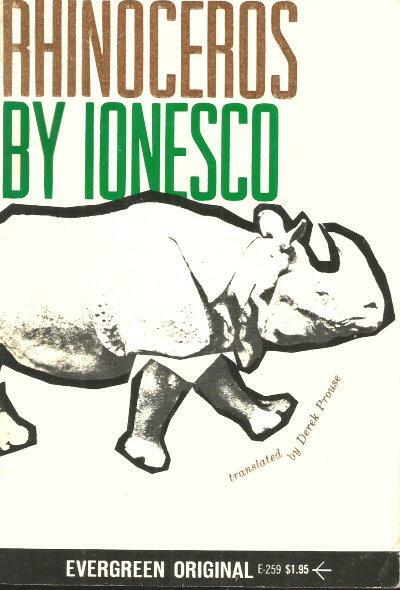 Rhinoceros, by Eugène Ionesco, Grove Press, French’s Acting Edition, 1960. In the play, Bérenger is a simplistic, shy, and kind-hearted man; Daisy is the love of his life. His pal Jean is intellectual and prideful. Initially, they and others are outraged when several townspeople become rhinoceros. But even Bérenger’s pal Jean succumbs, saying “Humanism is dead, those who follow it are just old sentimentalists.” Finally, Bérenger and Daisy are isolated in his apartment, the rest of the townspeople transformed into rhinoceros. Daisy quietly leaves to join the rhinos. For a moment, Bérenger attempts the transformation himself, but fails. At the close of the play, Bérenger shouts to the audience, “I’m not capitulating!” Then he returns to the window to hurl abuse at the passing rhinoceros. Olivier, Welles, and Rhinoceros. In 1960, the English Stage Company performed Rhinoceros at London’s Royal Court Theatre. Bérenger was portrayed by Sir Lawrence Olivier (married to Vivian Leigh at the time). Daisy was played by Joan Plowright (in time, Baroness Olivier). Orson Welles directed the play, at least in part through the encouragement of drama critic Kenneth Tynan. Interactions of these five theatrical personalities inspired playwright Austin Pendleton to compose Orson’s Shadow, 2000. 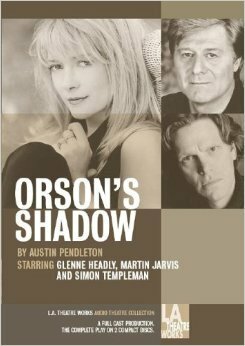 Orson’s Shadow, by Austin Pendleton, L.A. Theatre Works, 2006. This one brought up some memories. My wife was born in Czechoslovakia. Her parents were on holiday in 1968 without their two small children (my wife was not yet born) during the Prague Spring. They lived just outside of Prague and were not allowed to travel home to their kids for some time, and were not sure if or when they would be able to! Very stressful. My wife left the Czech Republic (which started on 1 January 1993, BTW) as soon as she could. That, of course, is a much longer story. My wife’s family are not such big fans of Havel’s. I have another friend, a Czech who grew up mostly in Slovakia (not living in CZ), and she was more of a fan, but also not so impressed. This might have more to do with general Czech mentality than anything else. All I’ve read about him was rather impressive, although I think he was more of a poet than a statesman. 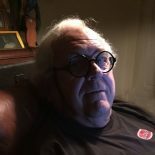 This entry was posted on May 11, 2018 by simanaitissays in And Furthermore... and tagged "Orson's Shadow" Austin Pendleton L.A. Theatre Works, "Rhinoceros" Eugene Ionesco, "The Garden Party" Vaclav Havel, Joan Plowright, Kenneth Tynan, Orson Welles, Sir Lawrence Olivier, Theatre of the Absurd, Vivian Leigh.